When our favorite Thai restaurant closed, Chris and I were really distraught. We both had go-to meals there (his was Pad Thai and mine was Pad Kra Prow) and we relied on their take-out every few weeks. 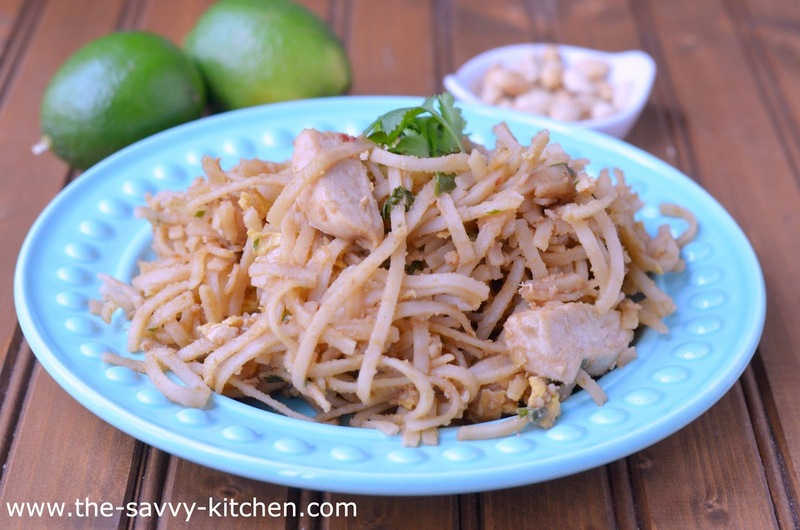 I had to fill our void somehow (and Pad Thai seemed easier to make than Pad Kra Prow!) so off to my kitchen I went. 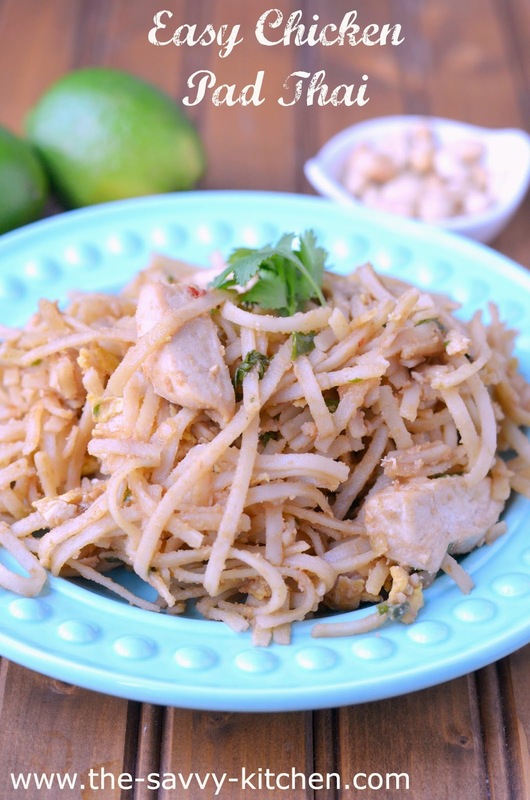 Pad Thai is a delicious combination of rice noodles, protein, eggs, onions and cilantro mixed with a tasty peanut sauce. The ingredient list isn't anything extravagant, so it wasn't too intimidating. 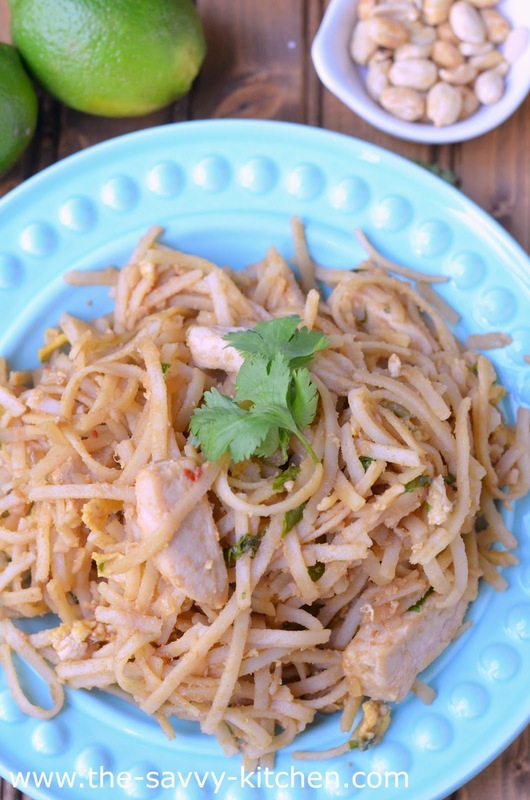 I left out the bean sprouts because Chris isn't a fan, but you should totally add them in for some texture. You can also replace the chicken with shrimp if you're feeling adventurous! This recipe was a wonderful substitution for Chris' favorite restaurant dish and I'll definitely be making it again. Enjoy! Cook rice noodles al dente, according to package directions. Drain and set aside. Meanwhile, season chicken with salt and pepper to taste. Add oil to a large skillet over medium heat. Add chicken and cook for 3-4 minutes per side. Remove to a bowl and set aside. Crack eggs over preheated pan (where you cooked the chicken) and allow to fry for about a minute, then break it up with a spoon and add the onions and bean sprouts. Add chicken and sauce. Add noodles and toss to coat the noodles in the sauce. Stir in green onions and cilantro. Garnish with peanuts if desired.